First held in 2012, our annual Celebration of Business has grown to be one of the region’s biggest and grandest business exhibitions. "One of the guiding principles of the John Lewis Partnership is our responsibility to contribute to the wellbeing of the communities in which we trade. I therefore warmly welcome the opportunity provided by Ely Cathedral to contribute to this Celebration of Business"
This year we are excited to hold the inaugural Celebration of Business Evening Reception and Dinner in the Cathedral's Lady Chapel raising funds for Ely Foodbank. Admission to this part of the day will be ticketed but like other events, will remain inclusive and accessible to all. More than 100 exhibition stands are available free of charge in the main body of the Cathedral and Cross Green. A unique opportunity to network and meet other local Fenland business leaders! This morning workshop with Cambridgeshire Chambers of Commerce is designed to help small and medium sized businesses understand and engage with technologies that can support business growth. Experts will explain how Artificial Intelligence is being used and impacting on everyday life, and attendees will leave with better knowledge of how you to embrace this in your own organisation. There are already four generations in the workplace, and soon to be five. 'They' say that Gen Y are flighty and that the older generations make more mistakes. 'They' call Generation Y the 'me, me, me' generation yet Time magazine thinks they will change the world. What are the generations, what are their differences, how do they view work, what do they each value in work? Russell Beck from the Impellam Group shares their latest research and thinking in this free workshop. "If you go to only one seminar this year, make sure it's this one. Russell is an exciting, engaging speaker and captivates his audience from his first word to his last." 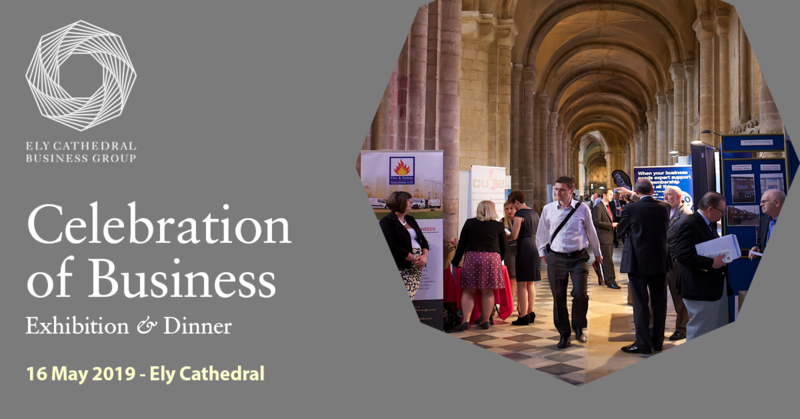 Building on feedback from previous events we are proud to introduce a revised format for the evening event with the Celebration of Business dinner in the Cathedral's magnificent Lady Chapel. Dinner tickets are priced at an accessible £25 per person and include a drinks reception and three course dinner provided by The White Pheasant Restaurant. We will be raising money for our designated charity the Ely Foodbank, and are delighted that the businessman turned Everest summiteer Ricky Munday will be joining us for the key note speech. Ricky Munday is an inspirational speaker, international expedition leader, Red Cross delegate and Chartered Accountant. To overcome redundancy, in 2004 he completed the toughest footrace on earth - the 150-mile Marathon des Sables. With a decade of expedition experience behind him, he reached the highest point on earth - the summit of Mount Everest - on 18 May 2018. He's since visited over seventy schools and businesses across the UK to deliver inspirational talks to over 14,000 people. He has delivered talks on perseverance, developing resilience, goal-setting and overcoming adversity at many of the UK's leading independent schools and corporations. A qualified Mountain Leader and Polar Ambassador who grew up on a council estate, Ricky founded Inspire Alpine as a social enterprise to help close the attainment gap that exists between disadvantaged young people and their peers. As a Chartered Accountant, Ricky is a resilient and highly motivated corporate services leader with an unusual breadth of experience transforming large, multidisciplinary and multicultural support functions in complex and insecure environments across the public, private and third sectors, and completed field missions in post-disaster scenarios in Africa, Asia and the Caribbean. Contact info@elycathedralbusinessgroup.org for enquiries, including sponsorship opportunities.